Shingai Primary School in Chiredzi is set to be one of the first schools in Masvingo province to introduce computer education at ECD level with the school having set aside a total of US$57 000 to construct a computer laboratory. 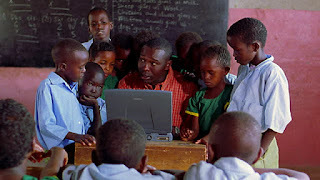 Speaking at the official opening of a new ECD block, Abell Tamuka, the school's headmaster, said they expected the computer lab to be completed before the end of the last term of this year. "We have set aside a total of $57 000 to cater for the construction of a computer laboratory which will benefit our ECD classroom and the other pupils. We want to equip the pupils with computer skills at an early age lie when their minds are still very receptive to new knowledge. "Construction is already underway and we are now at slab level hoping to finish the construction before the end of this year," said Tamuka. Tamuka also said that the laboratory will be made up of two sections with each section able to accommodate up to forty pupils. He thanked parents and the School Development Committee (SDC) for working together to ensure the development of the school. "I am grateful to all the parents who have made this possible by contributing to the development fund and the SDC who work tirelessly to quicken development at this school," said Tamuka. Deputy Provincial Education Director specialising in the junior section, Diga Mandiudza praised the school for leading the way in transforming education standards. "The move taken by this school is remarkable as it is a response to the President of Zimbabwe's quest for education which caters for the needs of today and which suits our identity.